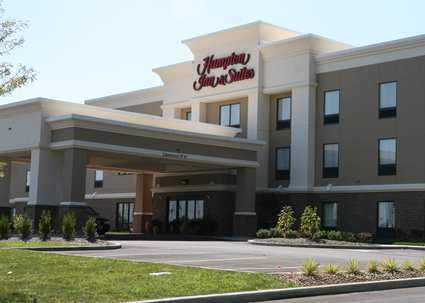 Enjoy a warm welcome to the Hampton Inn & Suites New Castle hotel, conveniently located in this charming small town only 50 minutes northwest of Pittsburgh, offering the best of both worlds. If you’re here on business, New Castle is home to the headquarters of Pyrotecnico Fireworks and Zambelli Fireworks, as well as Ellwood Mill Products, Jameson’s Candy Inc and Ondeo Nalco. In your leisure time, discover many local attractions such as Slippery Rock Creek Gorge with the whitewater rapids of McConnells Mill State Park. Also nearby is Moraine State Park in Muddy Creek Township, home to Lake Arthur, with hiking, bicycling, camping, and picnicking, and where an annual Regatta is held every August. Cascade Park, just east of the city, is a former trolley park that was restored and is now a regular outdoor park boasting historical buildings from days gone by, as well as plenty of fun events for the family. Watch a show at New Castle Playhouse on Long Avenue, with several shows a year. Another popular New Castle tourism spot is the Cascade Center, a shopping, dining and entertainment complex that was once the site of the first Warner Brothers movie theater.